Helpful tips and suggestions for discerning parents. 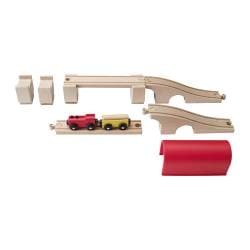 Ikea Wooden Trains: Don't get scammed by the Thomas the Train merchandizing mafioso. This train set is $10 at Ikea. The same set purchased from the Thomas the Train collection would run you roughly $100. (The single Thomas locomotive is $10 at Amazon!). I'd recommend buying at least two sets so that your kid(s) can build a fairly complex route. Ikea Children's Table (Kritter): We use this table all of the time, inside and outside. Combined with the chairs listed below, this table can be easily tucked away into a corner. God knows you have enough of your kid's stuff sitting around the house. 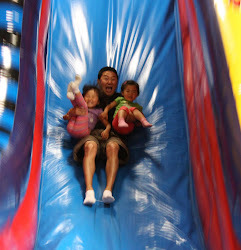 This is practical and the kids love it b/c its at their level. Ikea Children's Stool (Mammut): Our kids love these stools. And the best part is, they fit easily under the Kritter table when you're done with them. Note, they do take a few days for your kids to get used to them. Because there's no back to the chair, your kid may lean over and tip the stool over. But c'mon... its only about 9 inches off the ground. It doesn't really hurt! Once they're used to it, you'll be glad you got them. Seriously. 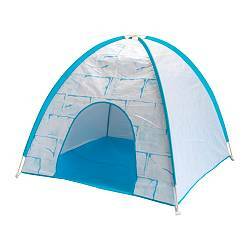 Ikea Koja Mini Tent: Our kids love this. It packs away very easily and can be carried around in a duffel bag. Its simple to put together and disassemble (unlike most Ikea furniture). No tools or nails needed, you just attach the rods together and you're done. We take these out when we go to picnics or sometimes just set it up in our yard. Black & Decker Junior Deluxe Power Tools from Costco: Our kids love "fixing stuff" around the house (including my belly and head) with these. Each of them spin, light up, and make noise. There's even an interchangeable battery pack for two of the tools (which actually ends up as a flaw since both of our kids always end up fighting for the battery). That said, if you want to train your kids early to "earn their keep," this is a great toy.